Printing shipping labels at home is convenient and fast. Paying for postage online is actually cheaper than at your local post office, so printing your own shipping labels saves you money in the long run. The USPS allows the purchase of Priority and Express Mail shipping labels online. Create an account on USPS.com if you do not have one. Continue with "United States" as your shipping destination in the drop-down menu. Fill in your own address at the "Edit Return Address" on the left-hand column. You may choose to save this address for future use by checking the "Save in Address Book" box. Fill in the recipient's address at "Edit Delivery Address" on the right-hand column. The recipient's email and reference is optional. 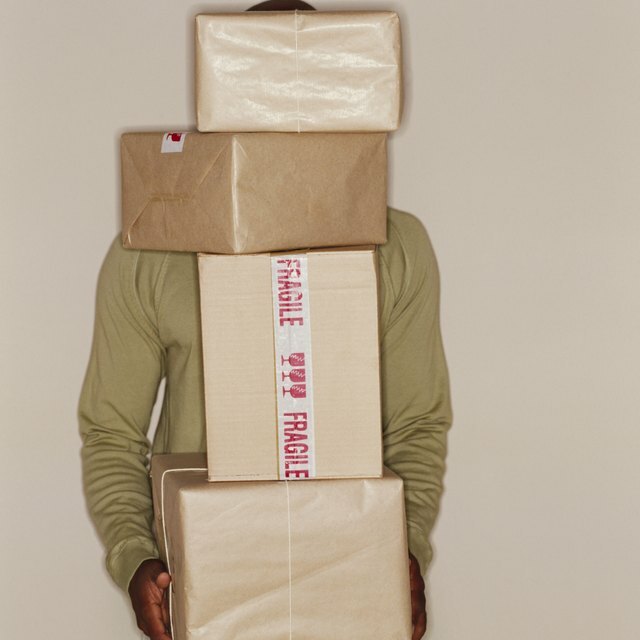 Weigh the package, including the unprinted shipping label and related packaging materials. Record the weight in pounds and ounces. Measure the length, width and height of your package. If it is larger than 12 by 12 by 12 inches, or if its circumference is more than 84 inches, select "Yes" next to the size question. If your package is smaller than the restricted size, select "No." Select the mailing date from the drop-down menu. You may choose a later date if you plan to ship it in the future. 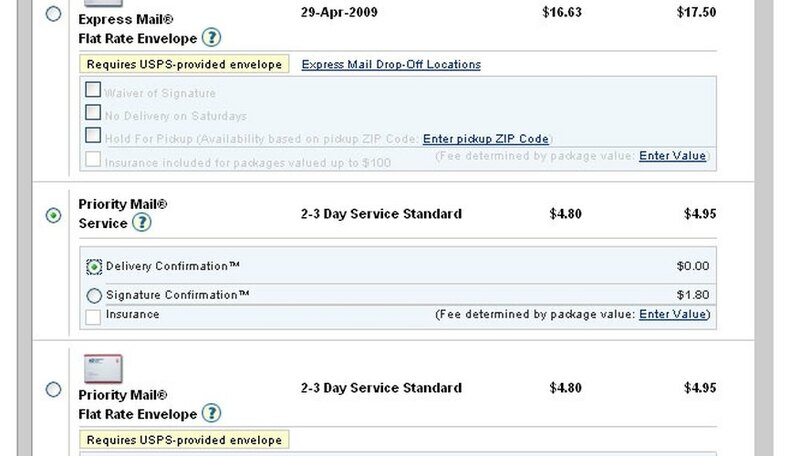 The selected date determines when your shipping label is valid. Enter your package's value if you are purchasing shipping insurance. Otherwise leave the value blank. Click "Continue." The postal service will present you with a list of shipping services. Review the prices and choose the one that suits your needs for this package. If you are using free packaging from the post office, you have to choose the exact service that corresponds to that box or mailer. If you are paying for signature confirmation, check that box, otherwise, click "Continue." Review your shopping cart. Double check the shipping and return addresses. 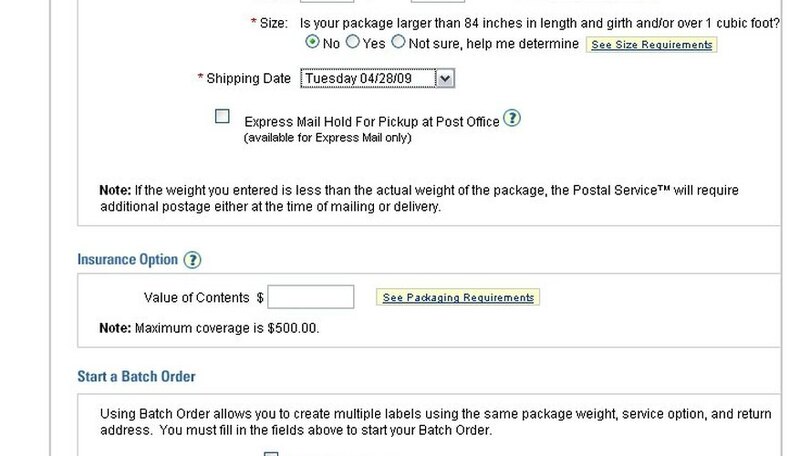 If you are shipping more than one package click on "Create Another Label." Otherwise, click "Continue" to proceed. Enter your credit card information. Continue to the next screen. An image of a sample label will appear. Check the box under "Your Agreement." Load your printer with a sheet of adhesive shipping labels. Click "Pay and Print." Your print manager will prompt you to print. Click "OK."
Examine your printed label. Select "Yes" if the label is printed correctly. Otherwise select "No" and USPS will return your label to your shopping cart. Your credit card will not be charged until you select "Yes." Use plain paper and clear tape if you don't have adhesive labels on hand. Cut out the label part and use clear tape to cover all four edges of the label completely. Make sure no tape is covering the barcode. Make sure that the address information and the barcode do not wrap around any edges of your package. Free USPS packages are for Priority and Express Mail only. Do not abuse USPS supplies.